Enjoying Spring and Happy Memorial Day Weekend! This spring has been filled with many changes, challenges and good experiences. Looking back at the goals achieved as well as the new ones made, I can see where my visionary mindset has truly taken me into the magnificent direction that has gifted me a sense of success, happiness and a feeling of being accomplished. This spring, I noticed the beginning of reaping the benefits of delayed gratification as a self-employed entity which continues to be sweetly rewarding. I further had the honor of helping someone grow into a fellow author and delivered appreciation toward many others. This spring of 2012, has been enlightening, inspirational and fantastic! Receiving blessings during springtime is delightful; a great way to begin the year. Spring is about rebirth and renewal. Many see spring as the time to begin something great and new. Animals usually naturally have their babies during springtime. Spring is a time to enjoy the beautiful new greenery and spring flowers. Even the spring rains grant those in agriculture a chance for a successful harvest. Spring is a time for rejoicing and seeing the year brimming with limitless possibilities. May, being a month where spring definitely is in full force, usually has warmer weather where my dog can enjoy the great outdoors longer. This means much to him for this beloved dachshund loves being outdoors enjoying the warm sunshine, literally basking in it. This brings me to the delicious thought of the traditional Memorial Day barbeque that many enjoy with family and friends. Where I live this particular weekend at the end of May normally has great outdoor activity weather, sunny and bright. 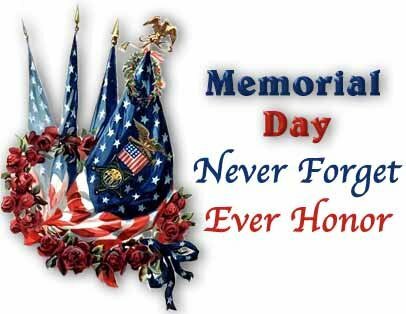 This year Memorial Day is Monday May 28th, which makes Memorial Day Weekend 26th – 28th. I truly believe this particular Memorial Day is extremely important considering all going on in the Middle East (Israel, Pakistan, Libya, Syria and Afghanistan). Many of us know someone or have a beloved one who is either currently serving in the armed forces or who has given their life in service. Most of us have had a friend and/or family member who have been in the US military, now a veteran. On behalf of all of these brave and gallant men and women, I plan taking Memorial Day off in their remembrance with much gratitude filling my heart. I shall take time to remember their noble sacrifice for the good of our country and its citizens. Those in the US Military do great deeds! I thank each one of them. Wishing all a wonderful Memorial Day Weekend!